What does it take to reach your 50th wedding anniversary? In these days of easy divorce, even reaching a 10th anniversary is real cause for celebration. Last weekend we drove down to Tennessee, sick child in tow, to attend my in-laws’ 50th anniversary party, wonderfully organized by their daughter. A friend asked them, “So I know you still love each other, but do you still like each other?” Good question! I pondered that as I thought about my own marriage going on 25 years this summer. Like my in-laws, my husband and I aren’t perfectly harmonious—we are actually very different in personality—yet we have stayed the course. Why? I figured the answer must be that old-fashioned idea of commitment. When young people say, “I do,” they have no idea what lies ahead. They don’t understand the extent of how they will each grow and change, sometimes in incompatible ways. They don’t understand how minor irritations can be magnified as though using the zoom option on a computer. The trick to staying together and being happy is to try to treat the other with respect despite the differences and annoyances, and to respect oneself enough to speak up (kindly, please) if the other seems to be overstepping themselves in the relationship. Respect, respect, respect. But above all, there is commitment to the relationship. There is no thought of the possibility of divorce, the easy out. There is no thought of another choice. This is it, and you will make it work. Of course, both partners have to think that way. 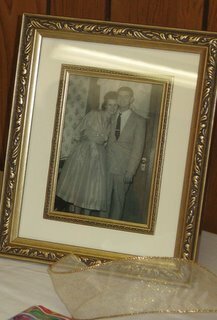 Helping my sister-in-law put together a photo collage of Mom and Dad’s lives was a beautiful part of party preparations. Someone had found a couple long lost wedding photos! The folks had run off to another town to get married at the courthouse with only a couple friends as witnesses. In the photo, taken afterwards at Dad’s house, teen-aged Mom in her pretty frock reclined across a comfy chair with her head leaned back onto a smiling young Dad sitting on a stool beside her. She is the picture of young love, relaxed and happy with eyes shining on a very special day. That old photo warmed my heart as I imagined many, many years ago how a handsome young man accidentally spilled soda on the pretty girl sitting in front of him at a basketball game, and they got married.